Come and have a look at our newly joined bus operator! We are very excited to introduce Meridian Holidays to our valued customers. Meridian Holidays has joined BusOnlineTicket.com to offer online booking service for their bus ticket. Through the partnership between BusOnlineTicket.com and Meridian Holidays, we can engage better with our customers by providing a convenient 24/7 online ticket booking experience to our customers. Meridian Holidays is a bus operator that is headquartered in Skudai, Johor. Meridian Holidays provides both single deck and double deck buses to run their bus trips. All the buses deployed by Meridian Holidays are fully equipped with air-conditioner, spacious legroom, and reclining seats to ensures their passengers can have a comfortable and enjoyable experience throughout the bus trip with Meridian Holidays. Meridian Holidays is widely known in providing bus from Kuala Lumpur to Johor Bahru and Johor Bahru to Kuala Lumpur. Meridian Holidays offers convenient pick up and drop off point in Kuala Lumpur which is located at Terminal Bersepadu Selatan (TBS) while the pick up and drop off point in Johor Bahru is located either at Larkin Bus Terminal or Tun Aminah Bus Terminal. The price for bus between Kuala Lumpur and Johor Bahru is reasonably costs from RM34.30 per way. This route is basically one of the highly demanded bus service in Malaysia. 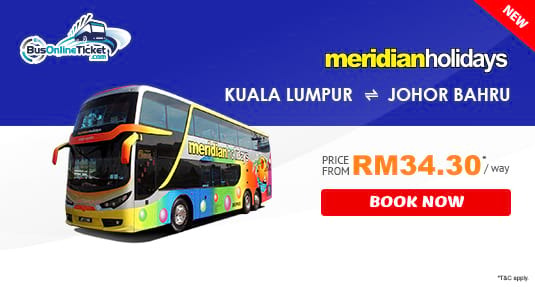 We advise you to book your Meridian Holidays bus ticket between Kuala Lumpur and Johor Bahru online in advance at BusOnlineTicket.com now to secure your seat. Instant email confirmation will be sent to you once the payment is received. Get your ticket now!